Published: March 25, 2011 at 04:39 p.m. There have been a lot of negatives tossed around lately when it comes to Auburn quarterback Cam Newton, and itâ€™s understandable that NFL teams must perform their due diligence to learn everything they can about him if they are considering drafting the Heisman Trophy winner next month. Iâ€™ve talked to a lot of players and coaches who were around Newton at Auburn, people whose opinions I trust, and Iâ€™ve come to this conclusion: Newton is the real deal. 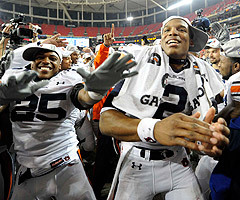 Teams shouldn't have concerns about picking former Auburn QB Cam Newton according to Gil Brandt. The biggest concerns being voiced by personnel types have been about questions surrounding his work ethic and character. From my own personal interaction with Newton, I can vouch for his character. But Iâ€™ll defer to those who were closer to him. Folks at Auburn will tell you that when Newton arrived on campus in the winter of 2010, he did not do what many young student-athletes do at Auburn â€“ that is, he did not take off on weekends to hang out in Atlanta or Birmingham. Newton stayed on campus to work out on weekends. After a while, his teammates gravitated toward him and started rallying around him. â€œIf the quarterback was sticking around to work, why shouldnâ€™t we?â€� This was a turning point, a sign that Newton had the work habits and the best interest of his team at heart. Talent alone didnâ€™t win Auburn the national championship. Newtonâ€™s leadership off the field played a key role. As for character, I have not found anyone that will speak badly of the kid. There are questions about his fatherâ€™s role in the pay-for-play investigation, but Cam Newton maintains he was not involved. There was the issue of a stolen laptop when Newton was at Florida. But when it comes to character, there have been no problems. By all accounts, he doesnâ€™t cut lines at school, doesnâ€™t blow off classes. He rides around campus on a scooter and is friendly with the student population. Falcons scout Matt Berry was the group leader who led around Newtonâ€™s group at the combine last month. He said Newton never complained and was never late for a meeting. Despite the big media splash over Newtonâ€™s comments last month about wanting to be an â€œicon and entertainer,â€� I have no doubt that Newton is much more grounded than people think. His stability has a lot to do with his family. And after visiting with his mother and father, who have been together for 25 years, I can see Newton has a great deal of stability. The one thing most people will agree on is that Newton has a ton of talent, both as a passer and a natural athlete. The biggest concern is perhaps his lack of experience, having only played one season of major college football. But when you factor in his work habits and his character, the experience becomes less of a concern. There have been a lot of comparisons to Vince Young and JaMarcus Russell. Itâ€™s true that Newton is athletic like they are, but Newton plays more under control than those guys did coming out of college. He wonâ€™t make the careless plays, thinking he can rely on his athletic ability to get him out of trouble. Will he be as productive as Sam Bradford was in his first year? No. But he will be a big-time quarterback in the NFL within a few years. This is a special guy. About 75 percent of media felt he was good and confident at combine. Others thought cocky. I side with the 75 percent that said confident. Hour-long media session, followed by a session with Sirius. Sirius was on a break before going live, Newton never complained, and wowed the people.